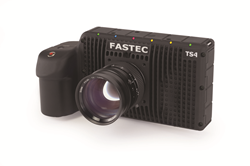 The newly released TS4 camera by Fastec Imaging operates as a high-speed camcorder and is capable of very long recording times. “Finally, a high speed camera that can be used as simply as any other camera we use in our everyday lives.” proclaims Matt Kearney, VP of Sales for Fastec Imaging. Full resolution 1280x1024 imaging at 510fps in SR mode, 365fps in LR mode. Frame rates greater than 60,000fps at reduced resolutions in SR mode, 6,000fps in LR mode. 720p HD video recording at 725fps for 13 seconds in SR mode, 500fps for 15 minutes in LR mode. VGA video recording at 1950fps for 14 seconds in SR mode, 1500fps for 15 minutes in LR mode. Gigabit Ethernet Control – with FasMotion software on PC, MAC, and Linux computers. Remote Camera Control – with any wired or wireless network device capable of running a web browser, such as a smartphone, tablet, or computer. Six Data Input Channels – with graphical display in FasMotion software and ability to create searchable markers with a user-defined logical filter. Full HD 1080p60 or 720p60 HDMI video output. C-mount, Nikon F-mount, and PL lens mounts available. Robust Camera Synchronization – with IRIG time stamps and synchronization available. Fastec Imaging is a global manufacturer of digital high-speed imaging systems based in San Diego, CA. The company specializes in uniquely portable and affordable high-speed camera systems, including handheld, point-and-shoot systems, compact PC-controlled cameras, and long duration record systems. Fastec cameras are used in many applications, including engineering, industrial manufacturing, packaging, medical and academic research, biomechanics, military range testing, sports performance, and broadcast entertainment. For additional information regarding Fastec Imaging, please visit Fastecimaging.com.